Looking for the perfect monocular for your hobby? We review the top monoculars for hunting and bird watching, and also the top night vision and thermal imaging devices. Whether it be for hunting, bird watching, or just capturing interesting experiences, monoculars are the light, compact, and effective long range viewing tool that you need. In today's massive guide we review the top performing monoculars for every situation. Besides taking an in-depth look at the indispenable regular monoculars, we also review the best thermal imaging and night vision monoculars currently available. We also pay special attention to the budget. Monoculars can get pretty expensive, so we've been careful to recommend the top performers in each budget range. Whether you're running a tight ship or you're prepared to splurge, we've got you covered in our ultimate guide. In our opinion, these are the greatest monoculars available right now. We've chosen the best models in each budget range, and we're pretty confident they'll fulfil the monocular needs of hunters and bird watchers alike. To start, take a look at the comparison table below. Here you can quickly compare the key features of the top models. Click on the image to check the latest price. Following the table we have more in-depth monocular reviews. Find out what we think of them and why. 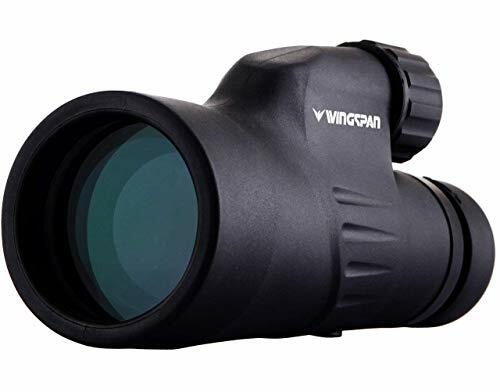 This monocular from Wingspan Optics offers incredible value for money that is hard to ignore. While the quality of the lens doesn't quite match what the more expensive models offer, at this price the results are quite remarkable. The lens is rated at 12 x 50. In layman's terms that's 12x magnification and a 50mm lens size. Magnification of this order is about as good as it gets in a monocular, and you'll be hard pushed to find a more powerful lens than this one. The 50mm lens also offers a really wide field of view, and a bright, sharp image. The image clarity is not quite what the Bushell and Leica models offer (we review these a bit later on), but again I'll point to the difference in price. 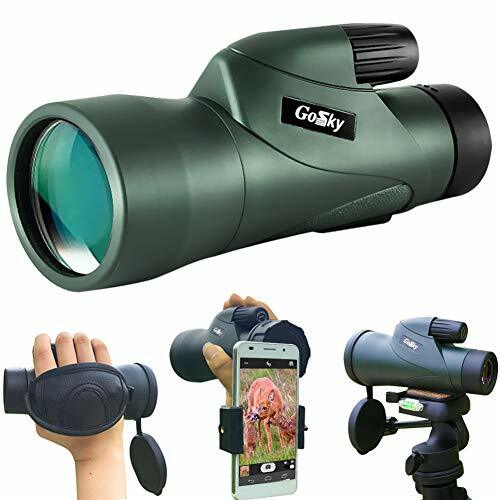 The wide field of view makes these great for bird watching or anything where you need a good general survey of an area before targeting in on something specifically. The monocular is waterproof and fog proof, so it's also well prepared for life in changeable weather conditions. Despite having such a large lens, it remains lightweight and easily portable. It measures 7.7 x 4.4 x 3.3 inches and weighs just 14 ounces. To put that into perspective, that's the same weight as an American football. A couple of final points that are worth noting are that it comes with a lifetime warranty and there is a carry case and lens covers included. Bottom Line: Despite being the cheapest of the monoculars we have featured, it actually has the (joint) most powerful magnification too. This is the perfect entry level monocular for those wondering whether to make the jump from binoculars. It offers amazing value for money! The Gosky monocular also offers amazing value for money. This time with a slightly more generous 55mm lens. This is actually the largest lens on the list, and a field of view that is hard to beat. This 55 mm lens offers a viewing field of 328 feet @ 1000 yards distance. That compares to 246 feet @ 1000 yards for the Wingspan Optics model (see last review). That's a huge viewable area that makes this model perfect for bird watching. That does mean that this is one of the heavier models around, weighing almost 16 ounces. In the grand scheme of things that's not awfully heavy, but it's definitely worth considering if you're going to be hiking long distances. The lens also offers an incredible 12x magnification. Like the previously mentioned Wingspan Optics monocular, this is really powerful magnification that you'll find very hard to beat. However, at this price point you'll find the image quality isn't quite as well defined as the next couple of models on our list of the top monoculars. It actually comes with a smartphone holder, so that you can easily take photos and record videos of your adventures. The smartphone easily clips on over the viewfinder. This offering from Gosky is dust-proof, waterproof and shockproof. I'm always a bit wary of things that claim to be shockproof, so I wouldn't bank on it being any stronger or less fragile than any other monocular would be. Anyway, the lenses are sealed with O-rings to prevent anything getting in the way of a good view. The eye-cup is adjustable to suit the user, and should be fine for use with glasses too. Unlike some of the cheaper models, this can also be mounted on a tripod for steady viewing. Bottom Line: The huge viewable area that the 55mm lens gives, makes this a great monocular for bird watchers. Besides the huge lens, it also offers amazing value for money. Another very solid budget device, that could be the best monocular for the money. The Bushnell Legend Ultra HD is a premium monocular that uses some high quality glass and has a durable build. It offers 10x magnification using a 42 mm lens, which is about standard for a decent monocular. However, unlike the cheaper models, the Bushnell Legend has a wider field of view which allows you to see more of the observable landscape. The 42 mm lens gives a field of view of 342 feet @ 1000 yards which is a wider field of view than both the Wingspan Optics and Gosky models we discussed previously. This is despite having a smaller lens. The main difference here is the quality of the glass. The Bushnell Legend uses what they call Extra-Low Dispersion fluorite glass. It makes the colors more defined and even performs well in low-light conditions. Anti-reflective coatings help to reduce eye strain and ensure the maximum amount of light reaches the eye. PC3 Phase Coating ensures the image is synchronized after being manipulated by the roof prism. Find out how the light is corrected here. Ultra Wide Band Coating gives optimum brightness and true color representation across the frequency spectrum. The Bushnell Legend is put together to withstand all types of adverse weather conditions too. The patented lens coating is completely water repellent and causes moisture to bead together rather than smearing over the lens. This means a clearer and brighter view than regular monoculars when faced with rain, sleet, and snow. The lenses are also totally waterproof and fog proof. Sealed O-rings and nitrogen gas ensure that even when submerged in water, the monocular will be dry inside. 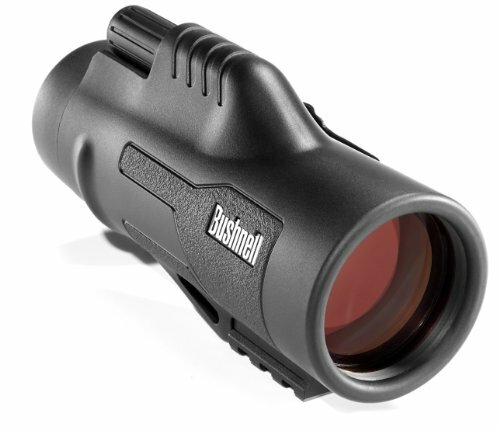 The Bushnell Legend also features twist comfort eye-cups, and includes a Picatinny rail and carrying clip. Bottom Line: This is just perfect for bird watching. It's got some really high quality glass, so you'll get a detailed image, even from far away. 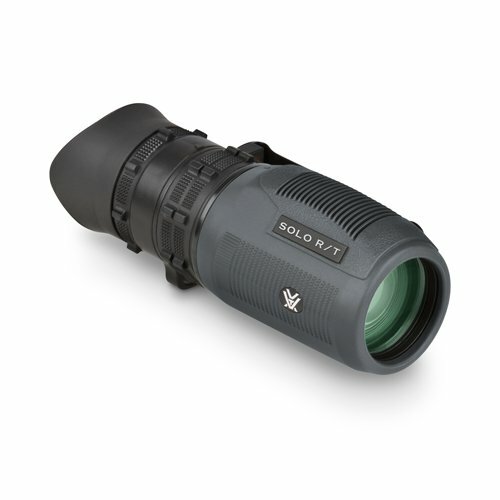 The Vortex Optics Solo is a highly regarded mid-price monocular that comes in a range of lens options. Vortex Optics specialize in hunting equipment and are known for producing well put together products that are extremely durable. The Solo model is no different and features a rubber armor to protect it from knocks. The rubber coating also provides a non-slip grip that keeps the monocular firmly in-hand, even in wet weather conditions. Besides being shockproof, the Solo is also fog-proof and waterproof. Despite being such a sturdy and durable unit, it only weighs 9.7 ounces! That's extremely light for a monocular, and is minuscule in comparison to the Gosky model which weighs 16 ounces. The 25 mm lens options are actually much lighter than this too. The Solo comes in a range of lens options. We're focusing on the 8 x 36 mm model but there's also 8 x 25, 10 x 25 and 10 x 36 options available. There's also specialized tactical version that has an MRAD ranging reticle. The 8 x 36 mm model gives an exit pupil distance of 4.5 mm which compares favorably with our other reviews and means good low-light performance. Its field of view of 393 feet is also the biggest we have included and makes it perfect for observing moving targets and surveying landscapes. The lenses also feature special coatings to help define colors and present clear, precise images. The 36 mm model has a utility belt clip, so that it can attach to flat edged surfaces and be quickly accessed when needed. It can easily clip onto a belt or strap and be ready to use in seconds. This kind of accessibility makes it perfect for the hunter or bird watcher. The Solo range also include adjustable eye-cups to make use with glasses more comfortable. Like most monoculars, it also comes with a lifetime warranty. Bottom Line: Highly recommended for the hunters out there. It's lightweight, durable, and perfect for spotting targets in the distance. Monoculars are generally pretty simple devices, but there are a few key things that you should look for before buying. In this section we give a quick run through of the terminology and features you can expect to read about when shopping for a new monocular. What do the numbers on a monocular mean? If you're an experienced monocular user then this section won't be of much interest, but for you newbies and first time buyers, it's really important that you understand what these numbers represent. Like binoculars, monoculars are rated with two numbers separated by an 'x'. For this example let's use 12 x 50. The first number indicates the magnification power of the lens. In our example, the lens offers magnification of 12x. The higher this number is, the further you will be able to see in detail. As the magnification power increases, the field of view will decrease too. The second number indicated the lens size. In our example, we have a lens size of 50mm. The larger the lens size, the bigger the field of view the monocular has. That means a wider, brighter image. However, there's a downside to having a bigger lens and that is physical size and weight. A large lens is quite a heavy and bulky piece of glass that you will have to carry. These numbers should play a big part in choosing the right monocular. Consider your intended use and make sure you get the lens that suits it best. Magnification powers of monoculars are usually set, so it's really important that you choose the right level for your use. If you get something too powerful then you'll find the image is hard to keep steady and the field of view might be compromised too. However, monoculars with higher magnification are perfect for hobbies like bird watching, where you want to see as much detail as possible. The problem of an unsteady or jittery image can be solved by using a tripod. Shorter magnification gives a wider field of view and things like watching sports are perfect for this type of monocular. However, monoculars with adjustable zooms are available. The Bushnell Legend (which we review above) is one such example where the magnification can be changed according to the situation. The field of view is the viewable size of the image. Your natural field of view is huge but when looking through a magnified optic (like a monocular) it massively decreases in size. Generally speaking, the more magnification, the smaller your field of view will be. It really depends on your intended use as to what kind of field of view is right for you. A wide field of view is much nicer for looking at moving objects. This might be the preference for bird watchers or sports enthusiasts. The field of view is usually measured in feet at 1000 yards distance (though sometimes in meters). It can also be given in degrees. If ever presented with a statistic in degrees just remember that the regular field of view for humans is 114 degrees. Let's take a look at the field of views of our 3 recommended monoculars. The field of view in the table is given as feet @ 1000 yards distance. From the table we can see that the Vortex Optics Solo has the greatest field of view. This makes sense given its lower magnification power. However, there's quite a large difference between the Gosky and Wingspan Optics models. This can be attributed to the larger lens size of the Gosky model. If you hold a monocular at arms length toward the sky, you will see a small, bright circle of light in the center of the eye piece. This column of light forms the exit pupil. The diameter of this circle is the exit pupil value. Generally speaking the larger the exit pupil value, the more light reaches our eye. However, the limit to this is that only light that enters our pupils can be seen. There comes a threshold where our pupils are saturated with light and a bigger exit pupil won't really make a difference. However, models with larger exit pupils will perform better in low-light conditions. Exit pupil is easily calculated if the lens magnification and size are known. We just divide the lens size (in mm) by the magnification power. For example, if our lens is 10 x 50mm, we have exit pupil of 50/10 = 5 mm. This isn't really an issue if you intend on using your monocular in bright daytime conditions. But, if you might experience low-light conditions then exit pupil should be a key factor in your decision. Let's take a look at the exit pupil for our recommended models. As we can see, the Gosky HD has the biggest exit pupil, closely followed by the Vortex Optics Solo. This means it allows the most light to enter the eye, and should have decent low-light performance. However, factors like lens coatings and glass quality also have a bearing on low-light performance. Factors like the size and weight of the monocular should play a role in deciding how easily portable it is. The better quality models are usually a bit heavier due to the weight of the glass. They usually come with a protective case which can be easily clipped onto a backpack or stowed in a pocket. Depending on your hobby this will have different levels of importance. For the hunter or hiker a very durable monocular will be a priority. For the bird watcher, this won't be such an important factor. The eye relief is the distance from the viewing lens to the eye that provides the best image. It's basically the optimum viewing distance with respect to the eye and the monocular. This is only really an issue for those that wear glasses. If the eye relief distance is too short, then the glasses might have to press hard against the eye-piece which might cause discomfort. Those that wear glasses should look for a monocular with an adjustable eye-cup. This feature is perfect for wearers of glasses. Digiscoping is the somewhat new term given to the practice of attaching a camera or smartphone to the monocular and taking pictures or videos. Some monoculars provide mounts so that smartphones can be easily attached over the eye-piece. Mounts can easily be purchased as an extra at relatively little expense too. Most models come with lifetime warranties and are built to last. There's really nothing here that should break of its own accord. The number one cause of monocular failure is.... dropping it. Of course this isn't covered by a warranty. To see how our eye judges depth and distance with one of these devices, don't miss our latest article. Choosing the right night vision monocular is a bit of a more complex job than picking a regular monocular. For a start, there's a choice to be made in what method of night vision you use: thermal imaging (infrared) or image intensifying. But, there's no need to stress. We explain all the key features that you should consider when buying a night vision monocular. We also recommend the top models for a variety of different budgets. Whether you seek the best cheap thermal monocular or the overall best digital night vision monocular, we've got you covered in our ultimate guide to night vision. To begin, we've put together a table where you can compare our top recommendations. Following the table, we go on to review each model in more detail, and say why we think it deserves your consideration. If you're new to night vision monoculars then our buyer's guide is a great place to start. We explain the choices you'll need to make and what features you should be looking for. Next, we take a closer look at each model in the table. We start with the regular night vision monoculars that use the image intensifier method. Following those, we review the top performing thermal monoculars. Find out why we think each device is worthy of a place on our list, and why it might make a great addition to your tool bag. This Solomark night vision monocular firmly solidifies its place as the best budget model around. It makes night vision affordable, but doesn't skimp on features either. It uses an IR (infrared) illuminator to produce enough light for the device to work. IR is invisible to our eyes, so the light it emits isn't detectable by anyone or anything else in the region. Image intensifier type devices like this rely on reflected light in order to work, so using an IR illuminator is a clever trick that helps boost image quality in particularly dark environments. The illuminator actually has 7 light levels that can be adjusted until you find the right balance for your current light conditions. It records both video and images which can be saved on a micro-SD card (4Gb card included). The images can be viewed in real-time on the color LCD screen (viewed through the eyepiece) too. It has AV and USB outputs (cables included) so the recordings can be easily transferred to a computer or viewed on a television. The Solomark also includes a fixed zoom. It's by no means a top quality zoom and you'll get some graining at the maximum magnification of 2x, but it's a really nice feature to get in something in this price bracket. The important thing to remember with this model is how much it costs in relation to the top of the line models. If you want a high quality, powerful zoom then be prepared to add an extra zero to the price tag. Anyway, the zoom has 3 fixed magnification levels of 1.3x, 1.6x, and 2x. Regarding portability, the Solomark is really quite compact and measures just 5.8" x 4" x 1.85". That's not much bigger than your average smartphone. It also weighs just 11.5 ounces. It has a tripod mount and can also be attached to a binocular harness for easy access. The outer shell is rubberized which helps with gripping it, but it's not substantial enough of a covering to protect the internal electronics from a fall. A couple of important final points worth mentioning are the 2 year warranty and the battery capacity. It takes 4 x AA batteries. Average battery lifespan appears to be around a few hours, but it'll depend on how much juice you're feeding the IR illuminator. Bottom Line: Night vision was once the reserve of the rich and the military. This gem from Solomark makes it affordable for all. If you're looking for high resolution image quality then I suggest you skip this one and spend a bit more money, but as an entry level product this is very hard to beat. The ATN Night Spirit 2 steps things up considerably from our budget pick: the Solomark. While the Solomark uses a generation 1 image intensifier to produce its night vision image, the ATN Night Spirit uses more powerful Gen 2 electronics that produce a brighter, crisper image. The image is better defined and of a higher resolution, but this technology boosts the price tag quite significantly too. ATN Corp have a fine track record in developing quality nigh vision optics and can list the US military, FBI, and the Department of Homeland Security as their customers. The Night Spirit 2 is definitely inspired by military type models, and is sturdily put together and completely waterproof. It's also able to be used in hand, or mounted to the head, helmet, weapon or camera (using additional hardware) . It too uses an IR illuminator to boost extremely low-light performance. Remember the paradox with image enhancement type night vision devices is that they rely on light to function. Using the IR illuminator, the Night Spirit 2 can work in complete darkness. This time it's coupled with a Gen 2 image intensifier that amplifies much more light than Gen 1 models. The image clarity is much better, especially around the edges. It uses a 50mm/ f 1.2 lens with a Proshield coating. The lens coating is designed to gather the most amount of light possible. This offers magnification of up to 3x, which can be manually adjusted. The field of view is 18 degrees which in comparison to the cheaper iGen model (next review) is really good. The iGen Night Owl delivers just 12 degrees. It's all powered using a choice of 2 batteries. There's the option of using a single 1.5 volt AA or a 3-volt CR123A battery. The battery life is around 30 hours for regular use or about 1/2 this if using the IR illuminator. Size-wise this is a bit chunkier than the average monocular. It measures 8.2" x 2.9" x 2.4" and weighs 1.4 pounds. This is huge in comparison to to our budget pick- the Solomark. But, in its defense, the quality of the optics and image intensifier of the ATN Night Spirit 2 are in a different league. A good quality night vision monocular needs to be of a certain weight to accommodate the quality electronics and glass that it requires. Bottom Line: The ATN Night Spirit 2 offers high quality performance at a reasonable price. Inspired by military devices, it offers image clarity and durability that make it a standout in this price bracket. 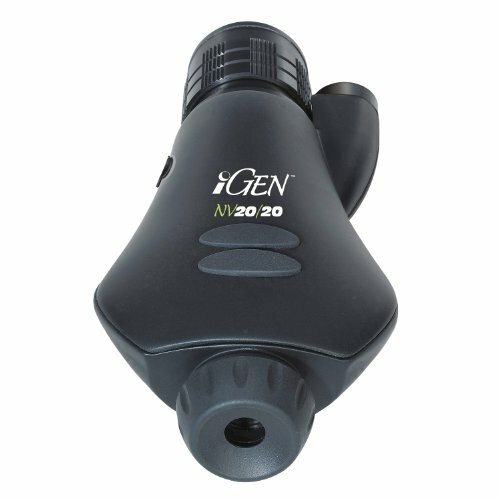 The Night Owl iGen 20/20 is our mid-budget pick that offers solid night vision performance without breaking the bank. It uses a special IR illuminator using iGen technology that is designed to get more light out of a situation. As a result, it's able to produce clear, well defined night vision images in even pitch dark environments. What separates this from the competition is that it doesn't actually use an image intensifier tube, or at least that's not what it's called. iGen use new image processing technology that departs from the traditional night vision set-up. They claim their proprietary technology surpasses the light sensitivity of even Gen 3 night vision tech, but I find this hard to believe. At a push it might contend with Gen 2, but it would be nice if they released some statistics to verify their claim. Anyway, it automatically reads the amount of light in any given situation and adjusts the infrared output of the illuminator accordingly. Besides this being incredibly useful, as it allows you to fully concentrate on the task in-hand, it means it's always running at optimum energy efficiency. The gain is also easily manually adjusted to deal with changing light conditions. This model is really ideal for video recording and is built with this form of media firmly in mind. It allows a variable frame rate of 2 fps all the way up to a smooth 30 fps. The video is easily recorded to an external device using the video composite output with an RCA cable. There's even a choice of color output too. If recording on an external device is a step too far, then don't miss the image capture model, that includes a built-in flash card. Size-wise it's on the larger side but it doesn't have the same mounting options as the ATN model. However, it can be tripod mounted. It measures 5" x 3.5" x 9.75" and weighs 1.25 pounds. One last thing to mention is the battery usage. It uses 4x AA batteries to work. This gives several hours of performance, but the lifespan is very much dependent on the use of the IR illuminator. This can be very power hungry when used at maximum output. Bottom Line: In our opinion this is definitely the top night vision monocular for under $500. It's not really built to stand the rigorous demands of hunting or hiking, but for the more casual "night owl" this gives great bang for the buck. Next our the top 3 thermal monoculars. We'll start with our favorite, the XP50. The Pulsar Helion XP50 takes handheld thermal imaging technology to the next level. Yes, it's a lot of money to spend on a monocular, but this level of performance can really make a difference, depending on what your intended use is. It's not for the occasional hobbyist, but those who are serious about handheld thermal imaging should pay close attention. The Helion XP50 boasts a resolution of 640 x 480 pixels. This kind of resolution is at the top end of what is currently available in thermal monoculars and you can expect crisp, well defined images. The Pulsar Helion offers lots of options when it comes to viewing these images too. Besides obviously looking through the eye-piece, pictures and video can be recorded on the integrated camera, or even exported in real-time via its onboard WiFi module. The WiFi module allows video to be streamed to your smartphone or tablet using the Pulsar app. It also allows the monocular to be controlled remotely using the app. This feature really expands the functionality of a thermal imaging device. It opens up the possibility of mounting the monocular on a boat or buggy and viewing the scene on the dashboard. There's no need to wander around looking through the eye-piece anymore. It also allows the scene to be live-streamed to others in another location. Each of these settings has optimized saturation and contrast levels to suit certain observation conditions and situations. The XP50 also includes variable magnification ranging from x2.5 to x20. The image is refreshed at 50Hz (50 times each second) which means it is always smooth and clear, even with lots of movement occurring in front of you. A nice touch is the 'picture in picture' function that allows you to zoom in on a target in the viewable scene. The XP50 has a huge range too. It's able to detect heat signatures of up to 1800m (2000 yards) away. The distance of the heat signatures are reliably estimated using the stadiametric rangefinder reticle. This uses estimated heights of observed objects to make a quick and precise judgement of the target's distance. We've talked a lot about technical features, but is it durable enough to withstand a couple of rough days in the wilderness? Well, for a start it's completely waterproof. It is IPX7 rated which means it will still work after being completely submerged in up to 3 feet of water for up to 30 minutes. As for rainstorms, absolutely no problem. It's also able to work in extreme temperatures. Helion state that it will "deliver flawless performance" in conditions ranging from -25° to +50°С. It uses an AMOLED display which is frost-resistant, and also energy efficient. On the subject of energy efficiency, the XP50 uses Helion's quick change B-pack battery system. These are designed to be quickly detached and replaced to minimize downtime. The rechargeable 5.2A-h battery packs give just over 8 hours of use in maximum (WiFi enabled) power mode. It will also take other battery types like AA and CR123A. Bottom Line: If you're serious about thermal monoculars then you won't go wrong with the Pulsar Helion XP50. Hands down one of the best thermal imaging devices in the business. An amazing piece of kit. 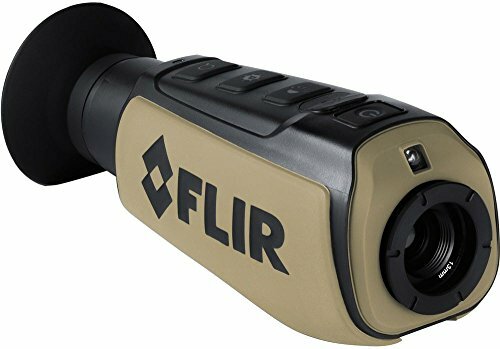 FLIR Systems excel in producing high-end outdoor and tactical equipment. The Scout III is the latest iteration in a popular line of thermal monoculars that are especially well regarded by the hunting community. The Scout III fills the mid-range price bracket in our thermal monocular recommendations. It's by no means cheap but it bridges the gap between our budget choice and our top pick - the Pulsar Helion. For the purpose of this review we will be focusing on the basic model, which has a 640 x 480 display resolution and refresh rate of 30Hz. For higher specs, including a more sensitive microbolometer, recording functionality, and a zoom, you should check out the more expensive 320 and 640 models. However, the big plus with the Scout III 240 is the massive field of view. It's an awesome tool for surveying a pitch-black night scene in front of you. Lets's start with the performance stats. The 240 in the name stands for the detection resolution on offer. A 240 x 360 microbolometer resolution like this is perfect for detecting targets in the dark, but the decreased clarity is noticeable when compared to high-end devices like the Pulsar Helion. For this reason, the Scout III will appeal mostly to hunters, who require a tool to highlight targets, before moving to something like a night-vision riflescope. It will detect heat signatures at distances of up to 1200 yards (1100 meters), with the image refreshing at 30 times per second (30Hz). A 30 Hz refresh rate is plenty for a thermal monocular, and presents a smooth, clear image, even in dynamic situations with lots of movement. The simplicity of the Scout III is perhaps one of its finest characteristics. It starts up in seconds and then a simple menu system allows quick, and precise alterations to be made to the polarity and LCD brightness. The 240 model doesn't have a zoom feature (see the 320 and 640) but it does have a freeze frame button. This allows the video to be frozen so that a single frame can be closely inspected. This is a cool feature that allows you to be extra vigilant when surveying a landscape. There are 4 choices of detection palette available, each specializing in a different type of condition. These are white hot, black hot, graded fire, and InstAlert™. The InstAlert™ option is particularly useful and allows you to tinker with the visibility settings quite significantly. I can see this setting working really well in hot environments. Besides the choice of detection palettes, there's also a utility light that allows you to put a spotlight on anything that needs identified following detection. The Scout III is designed with mobility in mind. It weighs just 12 ounces and easily fits in the palm of the hand. It comes with a neat carry-case too that will fit onto a belt or strap. It's also well put together. It's IP67 waterproof, which makes it pretty much immune to rainfall and a quick dip in a puddle. The IP67 rating means it can stand being submerged in water of up to 1 meter depth for no more than 30 minutes. It takes a lithium ion battery pack that gives around 5 hours of use. It also takes 5 hours to charge a battery from flat. It has an energy save mode that will turn the system off if inactive for long periods. 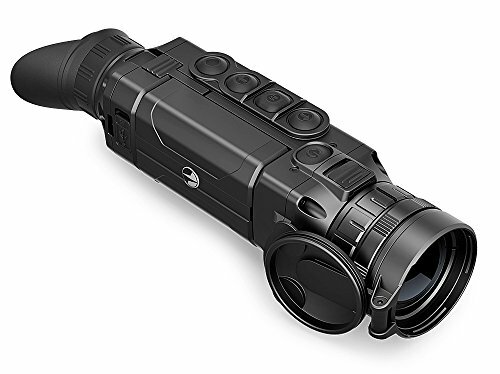 Bottom Line: The perfect thermal monocular for hunting. It's lightweight, durable, and perfectly designed for picking out targets in the dark. The Scout TK is the entry level thermal monocular from FLIR Systems. It's also our pick for the best cheap thermal monocular. While it may not be absolutely the cheapest on the market, it's definitely the cheapest, quality device available. And while it can't compete with the specs of our other two recommendations, it's the perfect companion for exploring nature at night. The Scout TK can detect heat signatures of over 100 yards (90 meters) away. It actually has the ability to take still images and record video too. The internal memory can hold up to 1000 images or 4 hours of video footage. Like the Scout III it has 4 choices of color detection palette (white hot, black hot, graded fire, and InstAlert™). These are designed to work in different conditions, so that your monocular is sensitive to heat signatures in any environment. Another similarity with the Scout III mode is the 640 x 480 display resolution. However, the Scout TK has a less sensitive thermal sensor than the Scout. It's powered by a rechargeable lithium-ion battery that gives around 5 hours of use. The battery isn't removable, but it's easily charged with the USB cable (included). The USB cable is also used to transfer images and video onto external devices. The Scout TK is the smallest and lightest thermal night vision monocular that we've included, by some margin. It measures just 5.9” x 2.2” x 2.2”and weighs only 6.5 ounces. To put that into perspective, that's about the same weight as a billiard ball. It's easily pocket-sized and includes a lanyard so that it can hang from a bag or be worn around the neck. Bottom Line: Simply, the best cheap thermal monocular on the market. It's the ideal entry level device that's perfect for casual users. Night vision monoculars can be quite complex devices. They've evolved a lot over the last few years, so it's always worth seeing where the current technology is at. In this section, we explain all the confusing terminology involved and highlight the things that you should be concentrating on when buying a new monocular. Thermal imaging or image intensifier? There are 2 types of night vision devices: the thermal imaging or infrared type and the image intensifier/enhancement (I2). They each form their night vision images in very different ways, each with its pros and cons. Let's take a closer look at how each of them works and in which situation they are best used. 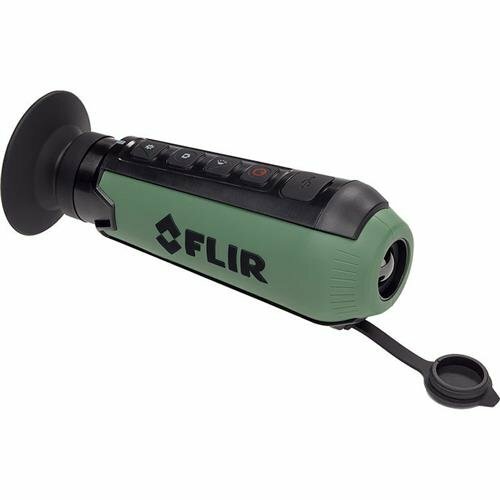 Thermal imaging or infrared night vision devices make use of a special sensor called a microbalometer. What this does is read the temperature difference between an object and the environment in which it lies. This temperature data is then converted into an image on screen. Different temperatures are represented by colors. Animals and people usually show up brightly on a thermal imaging camera due to their warm bodies. Image enhancement involves intensifying light sources so they can be better seen. A lens collects reflected light which is then passed through an image-intensifier tube. The light then causes electrons to be emitted by a photocathode. Then a photosensitive compound causes a few electrons to be turned into many thousand. What started as just a glimmer of light is now a stream of electrons. These electrons are then fired at a screen coated in phosphor. The phosphor emits light when presented with electrons. This light is what we see on screen, usually in a green colored image. Green is commonly used as it is thought that us humans perceive detail best in this color. There are a few things to consider when deciding which method of night vision is best for you. Thermal imaging devices are considerably more expensive than regular night vision devices. 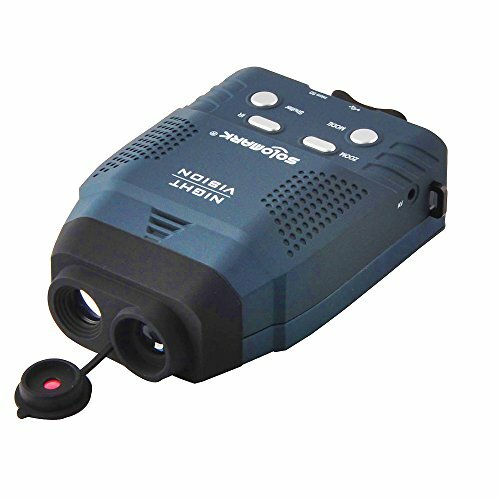 While image enhancement units start at just $100, the top thermal monoculars can cost many thousands. 2. Where will you use it? Thermal imaging is better suited to changeable conditions. It will work despite the presence of smoke, fog, or dust. It doesn't need to be dark for it to be effective either. Things like animals are effectively tracked using infrared imaging in the daytime too. The same cannot be said for image intensifiers, which offer no beneficial use in daylight hours. There are fundamental differences in the quality of information that each device produces. While a thermal monocular is highly adept at identifying the presence of something like an animal, it's unable to produce a clear, detailed image on-screen. The image that it produces is unnatural looking and doesn't include much facial detail in the interest of recognition. It can tell you that someone is there, but it can't tell you who that person is. An image intensifier on the other-hand is able to produce a more natural looking image (despite it being green). It also has a much wider field of view. This type of technology is much better at surveying landscapes rather than identifying presences. Thermal imaging is perfect for detection, while image enhancement is better for recognition. The two methods have their flaws and that's why they are so often used in combination with each other. The thermal imager is unbeatable at identifying the presence of something like an animal, but for detailed reconnaissance of a scene, the traditional night vision or image enhancement monocular is the perfect device to follow up with. How do I judge the quality? When browsing night vision monoculars you'll be presented with a of of technical jargon. In this section we'll explain how to interpret this information in a meaningful way. Let's start with the slightly more complicated image intensifiers (traditional night vision). The two key components by which to judge the quality of one of these devices are the image intensifier tube and the optics. While this is a good place to start, there are many other things worth considering too. Intensifier tube technology - image intensifiers are generally described as either generation 1, 2, or 3. Generation 1 intensifiers were the first iteration and remain the cheapest type available. They were improved upon by the generation 2 models which boost electron (and therefore light) production. The generation 3 models are the most expensive and most effective type currently available. Resolution - the optics are equally important when judging the quality of a night vision monocular of this type. The resolution (or image quality) is measured in Lp/mm (line pairs per millimeter). The higher this value, the better the image clarity you will get. The top night vision monoculars will have both high quality optics and a solid image intensifier tube. It's no good having one without the other. Magnification/zoom - this is really down to personal preference. Figure out your typical range of use and match the zoom capabilities accordingly. Just remember that increasing the zoom narrows the field of view and also makes the view more jittery. Recording capabilities - is it capable of recording images and video or do you need an external device? Perhaps this isn't even important to you . IR illuminator - this is the tool that allows image intensifiers to work so well. By pointing infrared light at a scene, it allows the sensors to pick up light from even the darkest of settings. A good IR illuminator will have plenty of options that allow different levels of IR to be used according to the amount of natural light present. The IR illuminator is probably the biggest drain on the battery so it's important that you can control it to run as efficiently as possible. Battery life - the more expensive models are usually a bit more energy efficient. Make sure to note what type of batteries are needed, and how long they are expected to last for. As mentioned in the last point, the IR illuminator is the major energy user here. Thermal monoculars are easier to judge. The two resolutions are the key factors here. Sensor resolution - firstly, we have the resolution of the microbalometer sensor. This is the part that picks up heat signatures from your surroundings. The higher the resolution of this, the more sensitive and therefore effective it will be. Display resolution - secondly, there's the screen resolution. Just like your computer monitor or television, this dictates the quality of the image that you will see. Basically, the more pixels involved, the better the clarity and detail you will see. Resolution of the order of 640 x 480 pixels and more is the reserve of the higher-end models. Lower resolution models can work well too, depending on the task in hand. Durability - a high-end model will be shockproof and completely waterproof (with a waterproof rating). Completely waterproof means it can stand being submerged. Observation modes - these are otherwise known as color palettes. They are the viewable color combinations that you see on screen that each work well in different situations. A good model will have multiple choices. Examples of these are sepia, hot black and InstAlert (made by FLIR Systems). InstAlert has various degrees of sensitivity, but at its highest setting only the hottest 5% of a viewable scene is highlighted. This allows you to really focus in on things like animals and ignore any would-be distractions. Detection range - this describes the maximum distance at which a device can detect heat signatures. The best models are going to give you as much as 2000 yards, but it really depends on your intended use. Zoom - the more expensive models will have zoom/magnification features where you can look closer at an event. The strength of the zoom usually increases with price. Refresh rate - this is measured in Hertz (Hz) and describes how many times every second that the viewable image is refreshed. The higher the refresh rate, the smoother the moving image that you see. Again this will increase with price tag. Battery - It's worth checking what type of battery it uses, if it can be replaced "in-field", and how long it will last. Top models usually have removable batteries that can be replaced in just a couple of seconds. Recording capabilities - not all devices have the option of recording, but if this is something you need make sure you check whether images and video can be recorded internally or if you'll need an external device. That brings us to the end of our massive guide to all things monocular. We'll add to this list when we discover new models that we believe are worthy of your attention. We'd love to hear of any hot picks that we've missed out too. If you're looking for a magnification device with a bit more range then don't miss our guide to spotting scopes. Make sure you follow us on social media as there is lots more to come from StealthyNinjas.com over the coming weeks and months.